As usual, we woke up before sunrise as our bodies were still living on Singapore time, despite being here for more than a week already. We were among the first at breakfast this morning. We left the hotel at around 8am after breakfast. 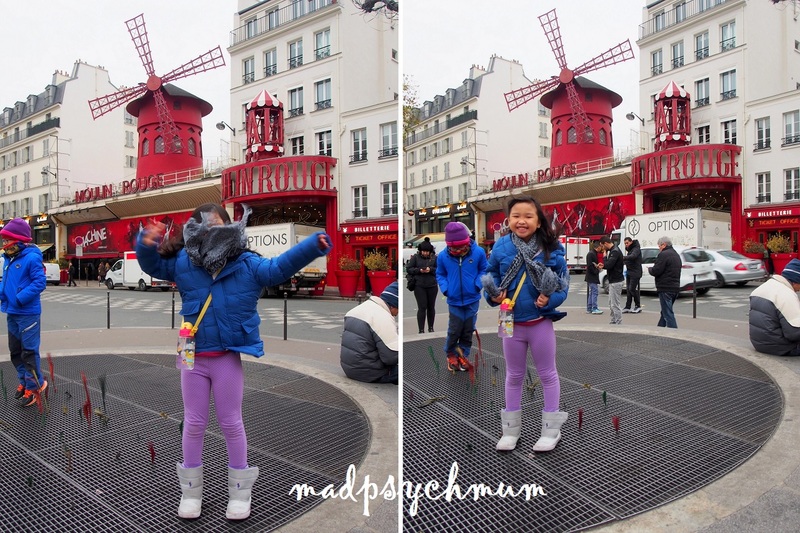 We were going to explore the city of Paris today via the Paris Metro (download the map here). Ensure that you have either coins or a credit card with you to purchase the tickets as the machines do not accept notes (more details here). Alternatively, you can also purchase your tickets from the customer service counter, however, that may not always be available. A single ticket will allow you to travel anywhere within Paris Central for the same price. You only need your ticket for entry as the Exit gates open automatically. You can purchase a single ticket at €1.90 per ticket or bulk purchase 10 tickets for €14.90. ALWAYS buy the tickets from the machine or the counter. NEVER buy it from random strangers walking around trying to sell you cheaper tickets (it might be a used ticket). You can also purchase Zone 1-2 Ticket Mobilis at €7.50 per person for unlimited rides within Paris Central. If you take less than 4 trips per day, it might be cheaper to bulk purchase 10 tickets instead of the Ticket Mobilis (which was the case for us). The latter is only worth it if you take more than 4 trips a day. 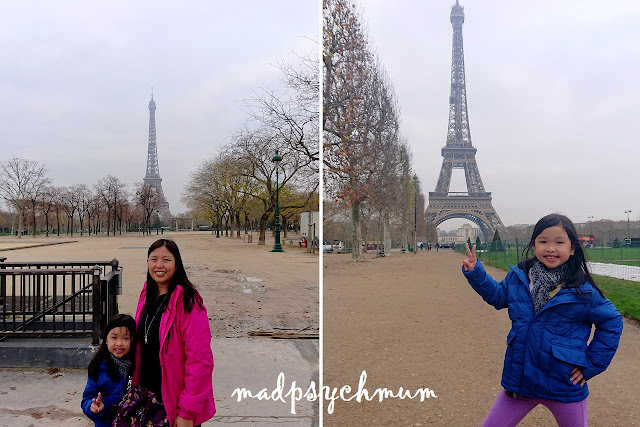 Our first stop was the main reason for our trip to Paris: Tour Eiffel aka Eiffel Tower! To get there, take Line 8 (towards Balard) from Grands Boulevards Station to Ecole Militaire Station. And this was where we met with the second NIGHTMARE for the trip (our first was yesterday while travelling on the Paris Metro with all our luggage!). When we boarded Line 8 at Grands Boulevards, a man suddenly grabbed the hubby's ankle and pretended that his ventolin inhaler was stuck to the hubby's socks! The whole cabin gasped in shock as the hubby tried to loosen the man's grip on him. In the struggle to kick the man off, the hubby realised that the bag he was carrying was unzipped! Thankfully the hubby had the foresight to put our money pouch in a pocket hidden deep in the bag so the thief did not manage to steal our valuables. By right the thief was not even supposed to be able to unzip the bag as it was an anti-theft bag that allowed us to secure the zips, however we had carelessly left the zips unsecured (we made sure it was secured at all times from then onwards!). The train driver stopped the train for a good 10 minutes while another man ensured that everything was OK before the train left the station. We are really thankful that nothing was lost and no one was hurt! Moral of the story: ensure that your anti-theft bag is locked and your valuables stored in the deepest part of the bag so that they are not easily accessed. Be vigilant at all times! After the shock on the train, we were a lot more cautious as we walked from Ecole Militaire Station to the Eiffel Tower. Although there were people who approached us, trying to sell their Eiffel Tower keychains, we didn't meet with any problems. Thankfully there were no crowds and there was a police car patrolling the area. It's the off-peak season hence there are very few people at the Eiffel Tower. I'm told that it is very rare to get a picture of the Eiffel Tower with almost no one in the background, which thankfully we did! We decided not to visit the top of the Eiffel Tower because it was too expensive and the family wasn't keen on it. Instead, we headed to our next destination, the very famous Arc de Tromphe. To get there, take Line 8 to Concorde Station and transfer to Line 1 and alight at Charles de Gaulle-Etoile Station. Follow the signs in the station to the correct exit. 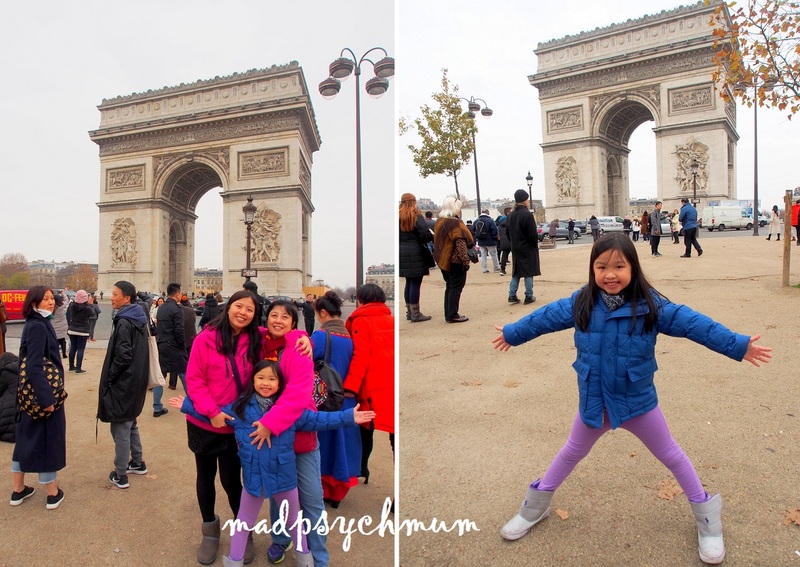 You can also choose to climb to the top of Arc de Tromphe (entry fee required) for a better view but again, the family wasn't keen (even though I was! *sigh*). 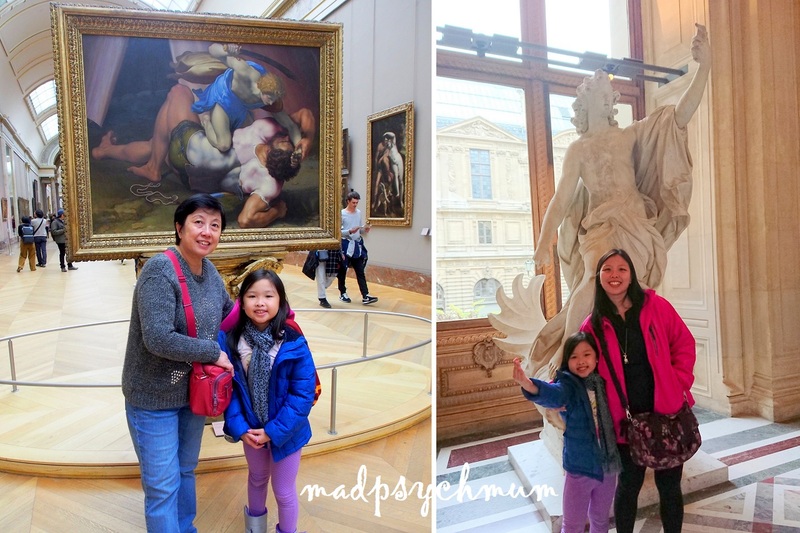 Our next stop was another famous landmark in Paris, Musee de Lourve, which has been featured in countless movies and TV shows. To get there, take Line 1 from Charles de Gaulle-Etoile Station and alight at Palais Royal-Musee de Louvre Station. At a shop called Tabac. A lot of people highly recommend buying your tickets from this shop as there is usually no queue. You can find out how to get there here. We decided to heed the advice of others and bought our tickets from Tabac, even though it didn't make any difference to us as there was no queue either way. It cost us €15 per adult (child is FREE). My girl really enjoyed the museum and the architecture! There are many entrances into the museum as the museum is really huge!! Be prepared to walk a lot if you want to cover the whole museum. We tried to cover as much as possible without killing ourselves but even then, we were so exhausted by the time we left! Of course the biggest highlight of Musee de Lourve is the Mona Lisa! 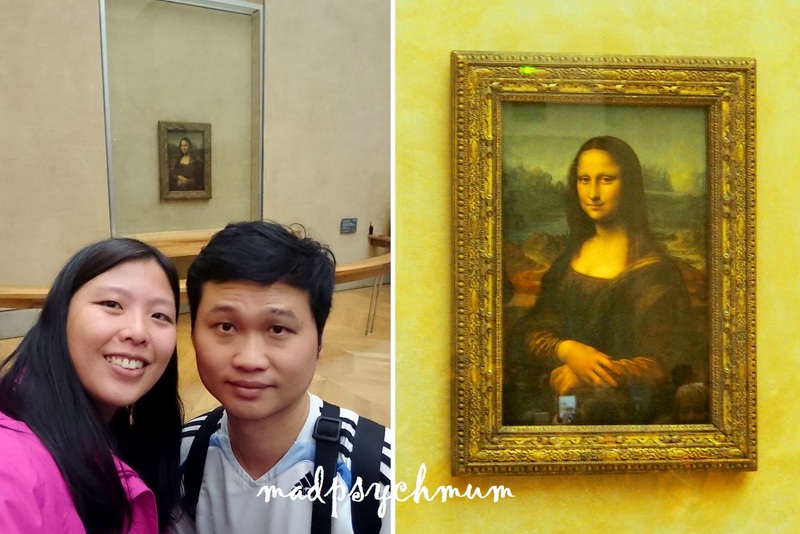 Us and the Mona Lisa! We explored more of the museum but I'm not going to post all of the pictures I took because you really need to come and see it for yourself. 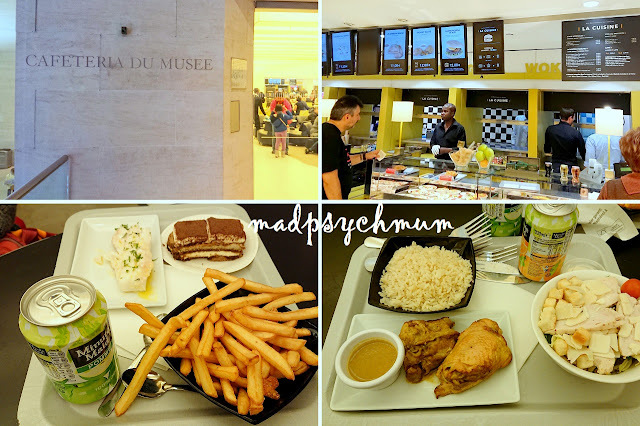 We soon got too tired/hungry and decided to have lunch at Cafeteria Du Musee. The food was pretty good even though it wasn't exactly cheap (food in Paris is expensive in general anyway). The hubby was delighted that there was rice and I enjoyed the tiramisu. You can trust the French to do a good dessert! After lunch, the family decided that they only had enough energy for one more attraction. I had to make the tough decision on whether to visit Sacre-Coeur, Cathédrale Notre-Dame de Paris or Moulin Rouge. 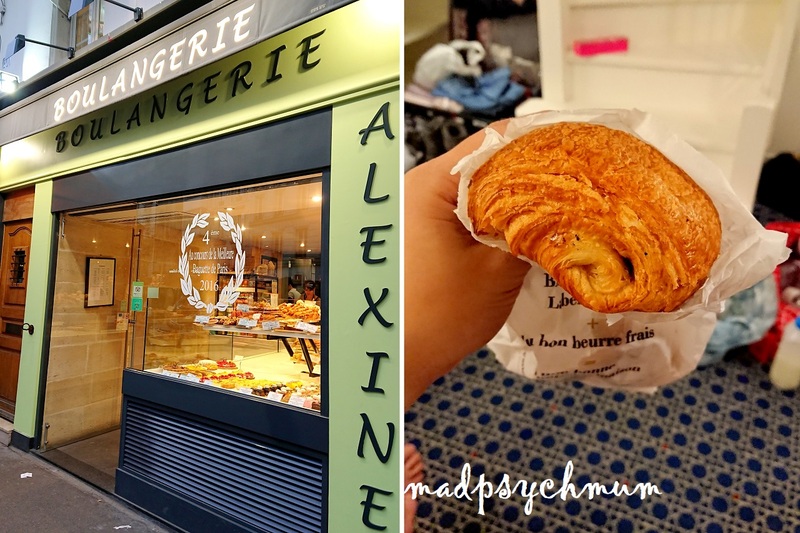 I ended up choosing Moulin Rouge, only because a very famous French bakery with some of the best croissants in Paris is located nearby! You know how much I LOVE croissants! We took Line 1 (towards La Defense) from Palais Royal-Musee de Louvre Station to Charles de Gaulle-Etoile Station and transferred to Line 2 (towards Nation) to Blanche Station. We followed Google Maps in search of the bakery with the awesome croissants. 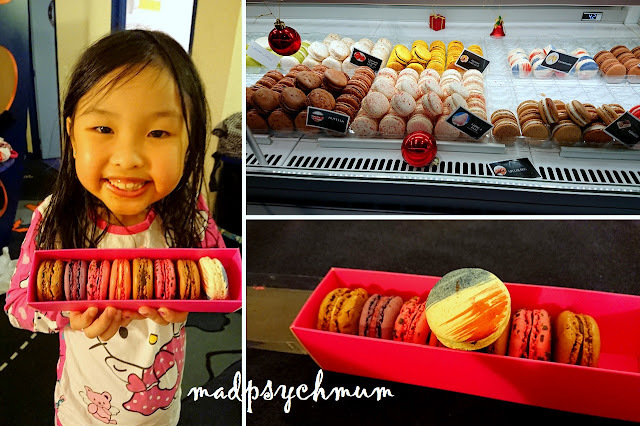 Found a macaron shop with a very friendly seller so we decided to buy macarons from him, even though his shop wasn't a famous brand. We ended up really loving the macarons!!!! Thankfully the hubby spotted Boulangerie Alexine down the road, which looked just as promising. We bought my favourite quiche and chocolate croissant and man, they were good! I am a huge fan of French pastries! The hubby, on the hand, was a typical Chinese male who must have his rice and noodles. Hence, we also bought 菜饭 (vegetables and rice) to go from Da May Fa. Rice is so precious here, it is sold in grams! Part of our dinner to satisfy the hubby's craving!